Primary hypertension (also called essential hypertension or idiopathic hypertension) is the form of hypertension that by definition has no identifiable cause. It is the most common type of hypertension, affecting 95% of hypertensive patients. Untreated hypertension is a risk factor in heart attack, heart failure, stroke, eye damage and kidney failure. Conventional treatments focus on lifestyle modification and antihypertensive drugs. In short, over-breathing can potentially contribute to high blood pressure and atrial fibrillation putting you at increased risk of heart attack or stroke. It is no surprise that snoring and sleep apnoea, symptoms of chronic hyperventilation, are risk factors in cardiovascular disease. In addition to lifestyle factors, research and clinical evidence indicate that over-breathing is a significant factor in cardiovascular disorders. There is a clear relationship between over-breathing and cardiac arrest and heart attack. 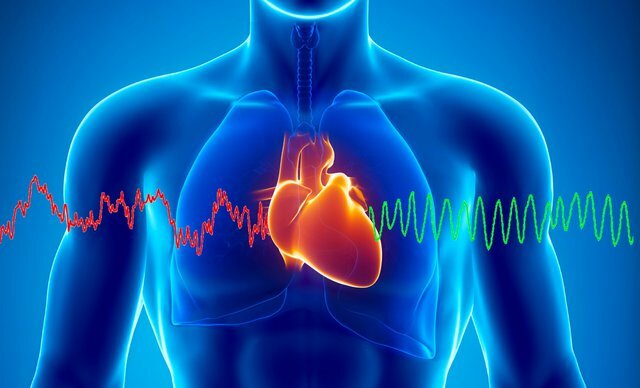 Follow this link to an article that explains the science linking dysfunctional breathing with cardiovascular disorders. It also documents research to date on the effectiveness of breathing retraining programmes in lowering blood pressure, pulmonary rehabilitation and reducing cardiovascular risk. Our programmes are designed to help restore a functional breathing pattern improving cardiovascular efficiency and helping reduce cardiovascular risk factors. Contact our clinic to book a consultation or for more information about our programmes. Kazmaier, S. Weyland, A. Buhre, W. et al. 1998 Effects of respiratory alkalosis and acidosis on myocardial blood flow and metabolism in patients with coronary artery disease. Anesthesiology 89:831-7. Neill, W.A. Hattenhauer, M. 1975 Impairment of myocardial O2 supply due to hyperventilation. Circulation. Nov; 52 (5):854-8. Foex, P. Ryder, W.A. 1979 Effect of CO2 on the systemic and coronary circulations and on coronary sinus blood gas tensions. Bulletin Européen de Physiopathologie Respirtoire. Jul-Aug; 15(4):625-38. Boix, J.H. et al. 1994; Modifications of tissular oxygenation and systemic hemodynamics after the correction of hypocapnia induced by mechanical ventilation. Revista Espanola de Fisiologia. 50:19- 26. Okazaki K, Hashimoto K, Okutsu Y, Okumura F 1991 Effect of arterial carbon dioxide tension on regional myocardial tissue oxygen tension in the dog. Masui. Nov; 40(11):1620-4.